The Russian Orthodox Church said it has effectively cut diplomatic relations with the Ecumenical Patriarchate of Constantinople, which has authority over some 300 million Orthodox Christians. It follows signs that Ecumenical Patriarch Bartholomew will recognize Ukraine's Church as independent from the Moscow Patriarchate under the leadership of Patriarch Kirill, formerly Archbishop of Smolensk and Kaliningrad. Ahead of the expected decision, Bartholomew sent two representatives to Ukraine this month, evoking the ire of the Russian patriarchate, AFP news agency reported. The Holy Synod of the Russian Orthodox Church, its ruling body, called an emergency meeting in Moscow on Sept. 14 and decided to downgrade ties with the Istanbul-based patriarchate, which has long been viewed as its rival. 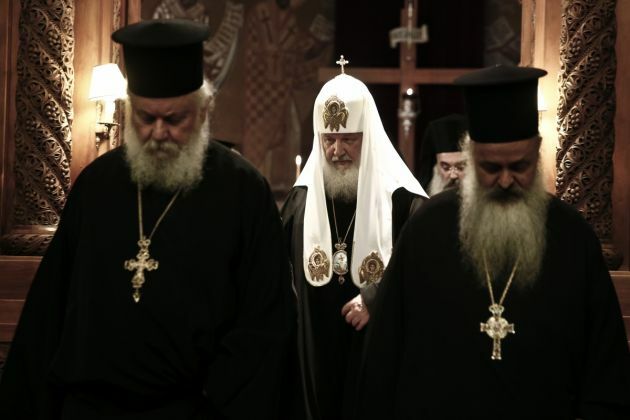 "With profound regret and sorrow the Holy Synod the Russian Orthodox Church learned about the statement made by the Holy Synod of the Orthodox Church of Constantinople concerning the appointment of its two 'exarchs' to Kiev," the Moscow Patriarchate said in a statement. The BBC reported that many Ukrainian Christians reject Kirill's perceived support for Russian-backed rebels in eastern Ukraine. Bartholomew I, known as Archbishop of Constantinople, New Rome and Ecumenical Patriarch, is regarded as the "first among equals" of the world's Orthodox Christians. Constantinople was the Greek name for Istanbul, Turkey's largest city. The city fell to the Muslim Turks in 1453 but has remained the historic seat of Orthodoxy, although there are only a tiny minority of Christians in modern Turkey. Russia is the nation with the largest number of Orthodox followers despite years of Soviet opposition to organized religion during the communist era. According to the Holy Synod's decision, the Russian Orthodox Church is to no longer conduct joint services with the Patriarchate of Constantinople and Patriarch Kirill will stop mentioning Bartholomew in his prayers. The Russian Orthodox Church will no longer participate in Episcopal Assemblies or any commissions or other structures chaired by representatives of Bartholomew, it said in its statement. It said if the Istanbul-based patriarchate continues its "anti-canonical activities" it will sever bonds completely. "In the event that the Patriarchate of Constantinople will continue to carry out its uncanonical activities in the territory of the Ukrainian Orthodox Church, we will be compelled to completely break off the Eucharistic communion with the Patriarchate of Constantinople. All the responsibility for the tragic consequences of this division will lie personally with Patriarch Bartholomew of Constantinople and the hierarchs supporting him," said the Moscow statement.